There are currently 4,887 users on this website. First, my thanks to 1typesetter for tipping me off as to the auction venue. It's one I had seen in passing before, but had never taken a closer look. 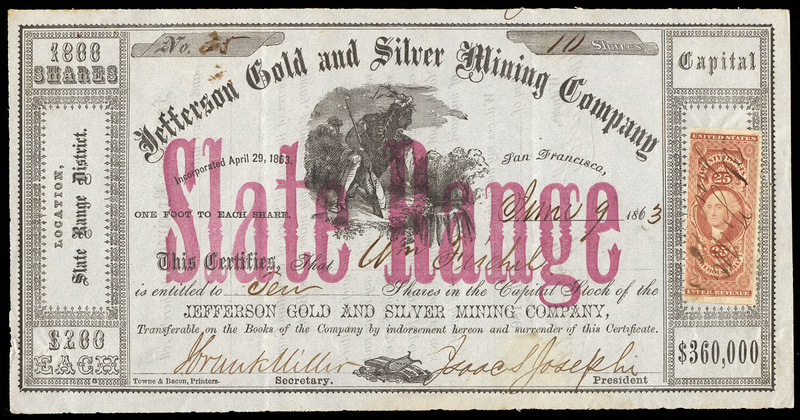 This is an example of R50b, the 25-cent Warehouse Receipt part perf stamp (current Scott value of $1,300) on a stock certificate from the Jefferson Gold and Silver Mining Company, in San Francisco, California. Several examples of this particular company's stock certificates have been found with R50b on them. There was an example in a Siegel auction last year, and another in Spink's Cunliffe collection auction in 2008. This example, however, is a much more convincing example than either of the above examples, in my opinion. It has very large margins both top and bottom, and the top of the next stamp is showing at bottom. Typical left-right part perf off-centering. Just brilliant. Did you buy this? Yes, it just arrived in the mail yesterday. A very nice example, indeed. Q/ Did it, at least, sell at a discount to face value? ikeyPikey, that's just the collatoral of the company. The stock issue is for 10 shares at $200 each. Still a lot of cash for 1863. (About $40k in today's money). These things are real interesting. I just came across the Jasmin auction that has a ton of this type of material, albeit a very disorganized lot setup. I think I saw consolidated copper company.